I was home with the family over the weekend and the discussion of what movie to watch came up. 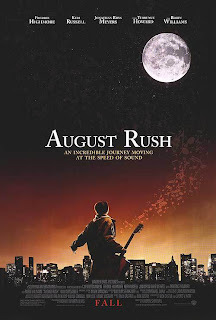 One thing led to another and August Rush became the movie of choice since my folks liked it a lot. And to be fair, it was indeed a rather good movie. Music has been an interesting angle to address in the telling of stories given it's practically a language of its own. Such is the way of the creative arts of course - each medium becomes a unique way to express oneself. And this movie really wanted to push that angle in terms of having a boy who was trying to live his life by following the music that he hears in his head. Part of me was rather surprised that this movie was not based on a book or something since the story felt very, well, book-appropriate. So major kudos to the writers for coming up with a movie experience that was so enriching and fulfilling indeed. I can think of a few other musically-including movies that left me feeling the way this one did - something I'll try to get into over the course of this review. Synopsis: August Rush is a 2007 drama film directed by Kirsten Sheridan. The story was written by Paul Castro, Nick Castle and James V. Hart. The song "Raise It Up" from the movie's soundtrack was nominated for Best Original Song at the 80th Academy Awards. At the center of this story is young Evan Taylor (Freddie Highmore), an orphan whose life is filled with music that everyone else can't hear, or something along those lines. He feels that the music that he hears in the rush of the wind or the passage of cars is part of a greater message - a link of sorts of his true parents. But naturally no one believes him at the orphanage and thus he is often ridiculed for his fervent belief that his parents are still out there looking for him. And the story of his parents is also an interesting one - a tale that involves the lead singer of an Irish rock band by the name of Louis (Jonathan Rhys Meyers) and a Juilliard-trained cellist, Lyla Novacek (Keri Russell). The two had a chance meeting one night and managed to conceive a child - although Louis never learns of this since Lyla's father interferes for the sake of preserving her musical career. And how this led to Evan being an orphan is all part of the larger tale to be told through the movie. Now to be fair, this movie is not meant to be a realistic depiction of events. It's definitely one of those feel-good movies that leans heavily on the side of becoming outright magical in how some of the coincidences and connections play out. So the movie does require you to suspend judgement and a fair amount of conventional logic in order for you to fully appreciate things. Let's just take the story as it is and go from there. Freddie Highmore certainly had a knack for playing the, um, special child - and not in a negative sense. There's just something about his range of expressions during these years that really went well with these sorts of roles. And yes, he certainly does believably present himself as the sort of precious young man who clearly sees the world in a manner that the rest of us normal people are unable to fully comprehend. Admittedly, I wasn't too keen on his parents. Their roles felt a little under-developed and their initial chemistry seemed all too plot-convenient, if you understand the drift of my meaning here. And on a similar note, the various father-figure types that come along in Evan's little adventure of discovery are all a little thin in the character development side of things. Don't even get me started on what supposed sway Wizard (Robin Williams) is supposed to have over the boy at that key moment in the movie. That just didn't really make sense to me at all. Plot and character deficiencies aside, the movie is still a lovely experience that is truly enriched by the robustness of the musical score. And while many movies claim to be about music, not all of them manage to capture the same sense of majesty and wonder that the score of Mark Macina created for this film. In this regard, the music becomes a character in itself, especially how its notes do indeed manage to draw connections between Evan / August and his long-lost parents. 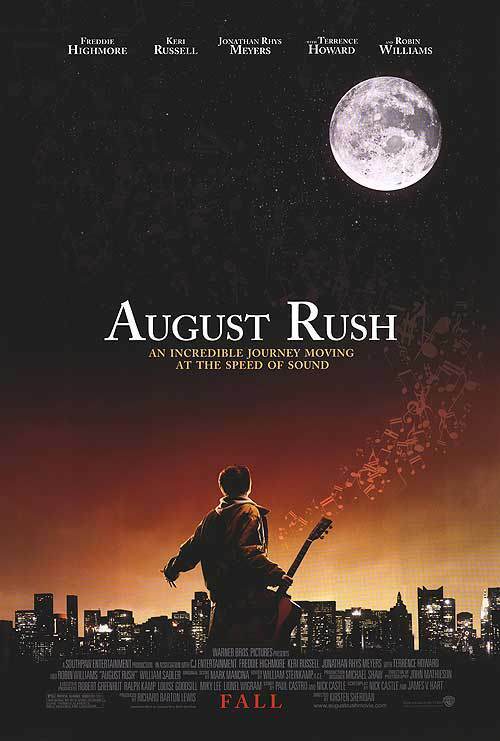 August Rush is indeed about the magic of music in our lives - or perhaps more the music of our lives, if that makes any sense. It remains a poignant and delightful movie that leaves a warm feeling in your chest as long as you didn't let your brain get in the way of things. I happily give the movie 3.5 startling and beautiful musical moments out of a possible 5.